This is part 1 of a 2 part post outlining 7 tips for converting Facebook likes into buys. We've blogged before about how Facebook is fantastic for word of mouth focused startups. While brand building and awareness is great, the key outcome from any marketing activity for an online retailer is sales. I recently put together a presentation discussing how we convert our Facebook page fans into buyers and I thought I'd share the slides and content here. I've discussed Seth Godin's Purple Cow concept in an earlier post, but essentially you want your product to be unique and interesting so that consumers want to share it. Particularly in this age of social media, if customers want to share something they now have some fantastic tools in Facebook, Twitter and YouTube to do that. Get customers sharing your product through those channels and your product will be introduced to their friends and ideally lead to sales. Offering customers the opportunity to design their own shoes is something unique in the shoe retail market. We view our customer service as a marketing activity to be invested in for the best return rather than an operational expense to be minimised, and we go out of our way to ensure all our customers are ecstatic with the service we offer. We pay a lot of attention to our packaging. Our customers receive their shoes wrapped in a beautiful shoe box, with a silk shoe bag, a developed photograph of their shoes, a handwritten note introducing them to their shoes and some inserts to help with comfort and fit. Each of these points is regularly talked about by our customers on our Facebook page and these comments form great testimonials encouraging other fans of our brand to buy from us. 2. Encourage the Facebook experience to be personal About 12 months ago we started signing off posts and comments on our Facebook page with the name of the Shoes of Prey person who was responding. Overnight engagement on our Facebook page tripled. Customers love talking directly to Jodie on Facebook after seeing her in the videos on our site, or Jonaye after speaking to her over email or the phone. 3. 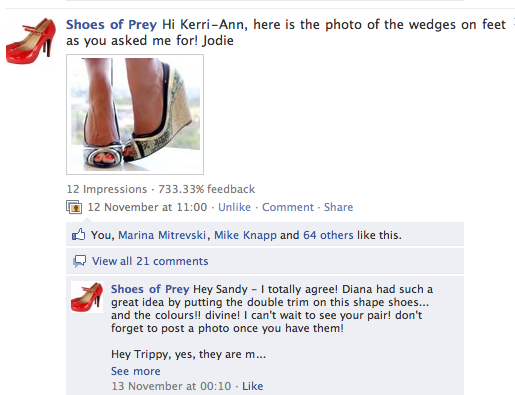 Customer service on Facebook converts A couple of days after we started doing this a customer asked Jodie if she could post a picture of someone wearing a particular peep toe we have in our designer, because she wanted to see how it looked on a foot. I photographed Jodie wearing a pair of wedges that a customer had designed with that peep toe. 4 days after the post had gone live it had 67 likes, 21 comments and most importantly we'd sold 13 pairs of wedges and quite a few other shoes with that peep toe design, higher numbers of those shoes than normal. The customer wrote in to us on Facebook and we could have responded via email or with a private Facebook message and we would have had a happy customer. Responding directly on the Facebook gave a much better result both for us and more of our customers. Cross posted to Startup Smart. These are good insight, Michael. Very timely. I recently attended Facebook's F8 developer conference and learned more about the open graph and frictionless sharing. I posted about how these changes will fuel the customization business here.